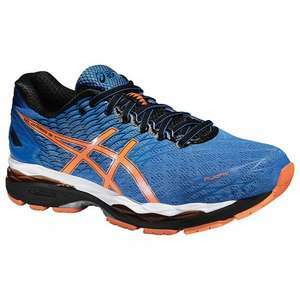 Several other Asics running shoes discounted, but this is a good deal for those looking to get a discount on the top line of the Asics running shoes line. No better than a cheaper brand that could be purchased for a 20th of this price. Only paying for the brand name. Can't agree with that. There is a lot of technology in the footbed of Asics shoes. I have suffered from plantar fasciitis for many years and Asics shoes are by far the best foot ware that I have found and I have tried many different makes. [quote=bearcat]No better than a cheaper brand that could be purchased for … [quote=bearcat]No better than a cheaper brand that could be purchased for a 20th of this price. Only paying for the brand name. [/quoteCan't agree with that. There is a lot of technology in the footbed of Asics shoes. I have suffered from plantar fasciitis for many years and Asics shoes are by far the best foot ware that I have found and I have tried many different makes. No better than a cheaper brand that could be purchased for a 20th of this … No better than a cheaper brand that could be purchased for a 20th of this price. Only paying for the brand name. Which shoes for a 20th of the price do you recommend? How far have you run in them? These are quality trainers. Amazing comfort and will last a fair while. Good price for anyone that can get their size and runs a lot. Which shoes for a 20th of the price do you recommend? How far have you … Which shoes for a 20th of the price do you recommend? How far have you run in them? I would be interested in decent running shoes for £4.35 and your review of them too. That would be a hot deal! I've just thrown a pair of Asics away. 5 years dog walking. Wonderful shoes. Expensive is not always better. Over the years ​I have picked up running shoes made by Hi Tec, Nike and Asics for under £5 and up to a little over £20 from my local Sports Direct. These have been specific to the store and normally limited to the one pair. My last purchase was a pair of Asics for a little over £20.